Another season begins at ANG Main Line Stitchers tonight! I am leading the Chapter Book Project, Jeannie’s Windmills by Pat Mazu. I’ll also use my tips for my other chapter, Keystone Garden. But, they don’t need it until October. So, the timing works out great! •	A gold sparkle canvas probably would have looked pretty since a lot of canvas shows. •	I attached each bead horizontally because the bead appeared to be tipping backwards and was showing more of the beading thread than I wanted. •	There is a discrepancy and an omission in the diagram. – The discrepancy is between the crescent placed in the upper left corner of the chart and the diagram of the crescent seen in the upper right corner of the chart. The left image shows Stitch 1 – 2 being one thread apart and an extra stitch that would be numbered Stitch 17 – 18. The diagram and how I stitched it was to allow for 2 threads to separate Stitch 1 – 2. – The omission is that Stitch 15 – 16 is not shown in the diagram of the crescent (upper right corner). 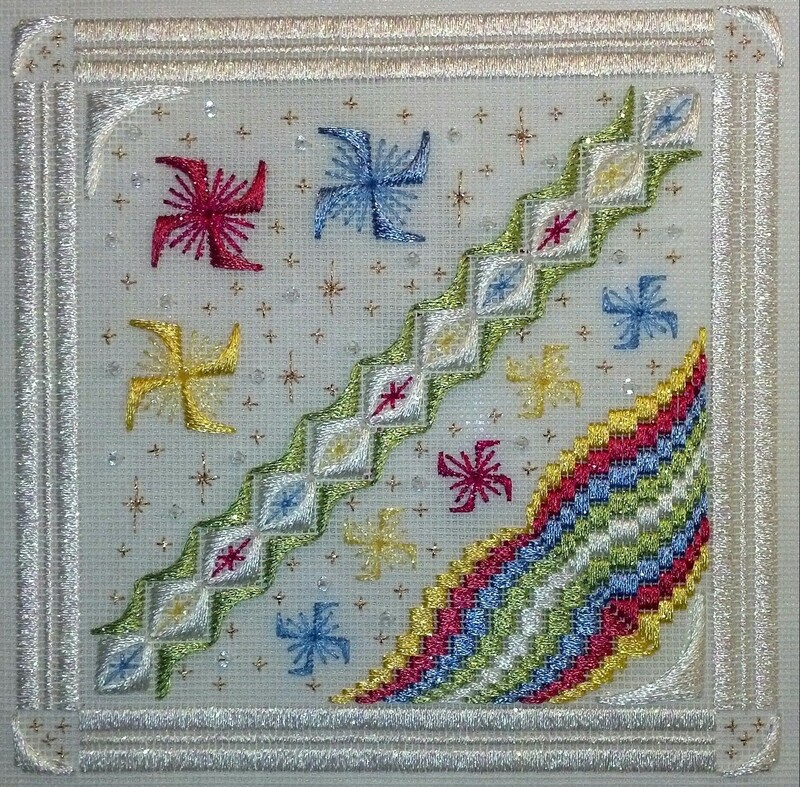 Very bright & colorful design & not too tough to stitch. We meet at St. Luke’s Lutheran Church, on September 8 (always the second Monday of the month) at 7:15 pm. GPS: 203 North Valley Forge Road, Devon, PA. For those who can, please join us for dinner at 5:30 pm (ish) at Minella’s (320 W Lancaster Ave). 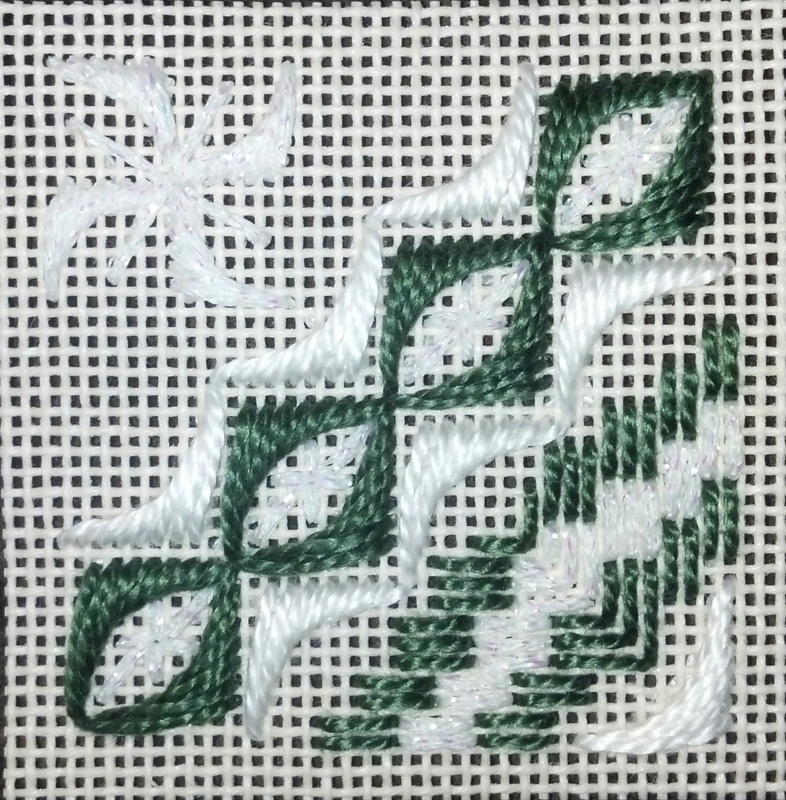 Both my local ANG chapters, Main Line and Keystone, are going to do the Chapter Book Project, Jeannie’s Windmills, by Pat Mazu (http://needlepoint.org/CPB/images/Project-4—Jeannie’s-Windmills.jpg). And, I volunteered to lead it for each group. I picked up the threads from Karen at Nimble Needle – love the ANG 10% discount she gives! Even so, I’ll keep track of the amount of thread needed & we may make mini kits for folks to keep costs down. 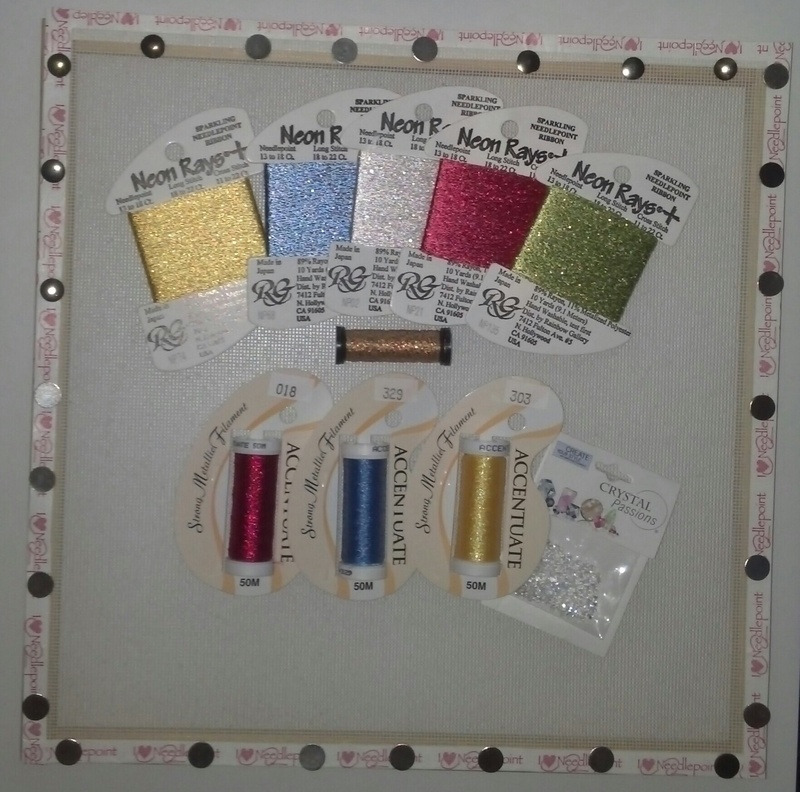 We can get 5 kits from the bag of beads. And, we’ll split up a spool of beading thread. It doesn’t seem like this piece will use a ton of thread. And, as Pat suggests, this makes a great stash project. Some may opt to go that route. Initially, I was going to jump in with both feet today until I decided to practice the crescent stitch. And, I’m glad I did. I kept missing the 3rd hole because I couldn’t see it do to the angle & because the thread covers the hole from the bottom. So, I practiced until I finished this little guy (2″ square).